Happy to annouce that I am now a D'Angelico Artist along with Bob Weir, Kurt Rosenwinkel and many other amazing musicians. Their guitars are wonderful and inspiring to play. Happy and grateful to be connected to D'Angelico. I am very happy to share that I am a featured artist for Phred Instruments. Check out the site, http://phredinstruments.com to see the DockStar model I play. I am a big fan of the guitars and happy to be a part of the Phred family, taboot! See the Artist Feature _here_. Celebration of Soul is the 10th album recorded in three years with 20 musicians documenting 50 original compositions. It is the first album to be released on a label, NYC's Miles High Records. Josh Maxey is a bandleader, composer and improviser. Maxey has released a series of 10 albums recorded in three years documenting 50 original composition recordings with 20 world class musicians in NYC and Colorado. The 10th, Celebration of Soul, was the first on a label and to have national radio play. Released on NYC's Miles High Records, Celebration of Soul has been played over a thousand times on FM Jazz radio stations. It made the JazzWeek radio charts, first in the most added category, then for 6 weeks as a chart bound record. It has been reviewed many times and well received, click _here_ for more about press. The series of ten albums has been downloaded over 40 thousand times. Maxey was an early adopter of Twitter in the jazz world and over the years has connected directly with thousands of listeners. The music has many fans that help to share and promote upcoming releases and performances. "For me, music is transformative. There is a beauty just beyond the audible pitches and writable rhythms which speak to the many peaks and valleys of the human experience. In sound, I find a flow of meaning, love and purpose. I am drawn to improvisation and find it to be the closest expression to the creative source itself." 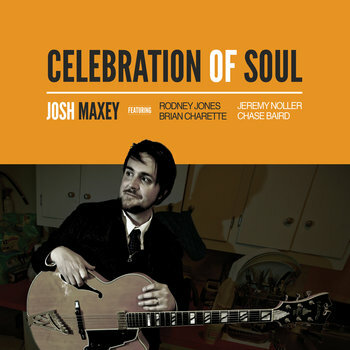 "Add Josh Maxey to the long list of guitarists who have changed the music itself. His tenth CD in the last three years is enlarging the vocabulary for six-stringed jazz...it's the more reflective moments that give one pause to consider Maxey as a potential great." "About that project… with the goal of recording six albums in a twelve month span, Maxey has offered up a series of remarkable sets, distinguishable from one another, yet clearly springing from the same creative source. Differentiation, yet maintaining cohesion. Modern jazz that’s clearly beholden to the blues, Maxey has carved out a nice little corner of the music world with his identifiable sound." "Sophisticated yet demure...even sublime at times, Maxey has embodied the culture of his experiences into a captivating collection that reinvents the wheel, over and over again. This is one collection of beauty & art through jazz that will not disappoint. Even the most critical of ears will find that this is a must have."